VIX slumped another point today, trading near its intraday lows of 18.75. This is the kind of capitulation we want in order to see a top in stocks. 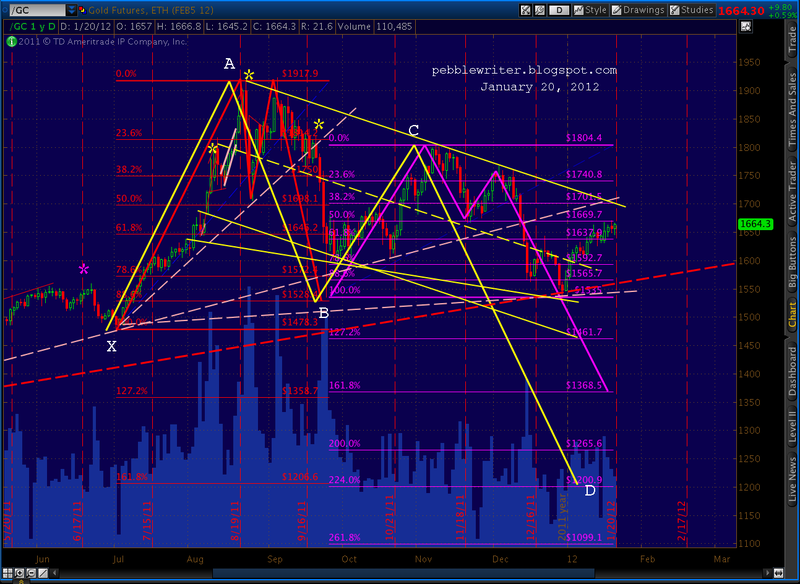 The small H&S; pattern we were watching has busted, and the Bat pattern has started looking off. 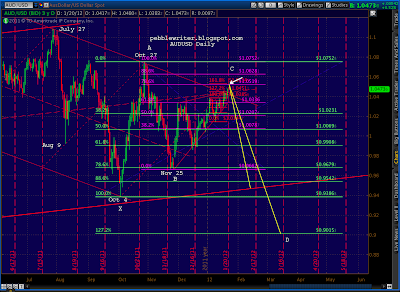 I’ve moved my Point X back to July 1. Starting at 15.12 gives us a .886 of 18.87 — very close to current values. The falling wedge within the falling wedge (red TL) is technically being backtested, yet it’s been undercut by a few points so we should probably forget all about it. 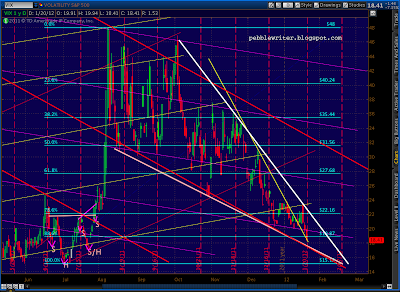 Beware: the larger falling wedge is still very much intact, signalling a upcoming surge in volatility. 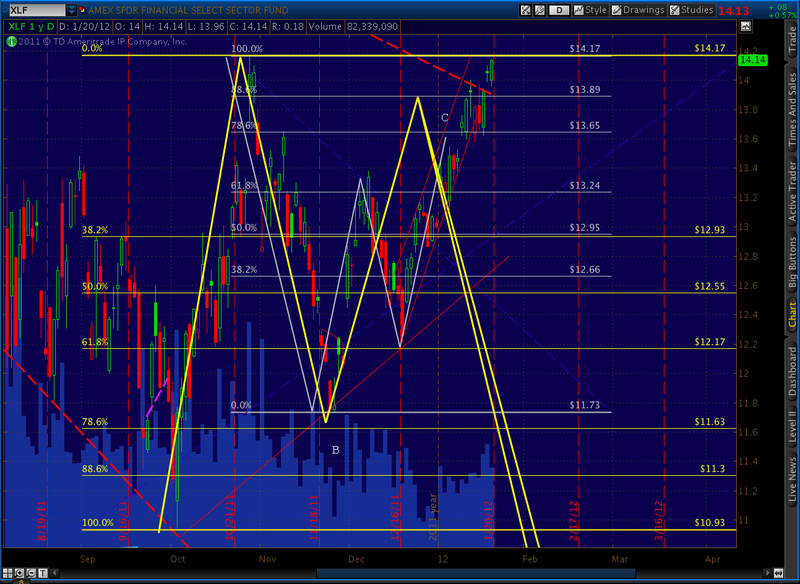 And, hat tip to SoulJester who correctly points out the Gartley on VXX, the VIX ETF. Checking in on XLF, it just scored a double top — coming within pennies of the Oct 27 high (last time the Greece problem was “solved.”) It blows the smaller Bat pattern we were watching, but I’ll take a double top any day. 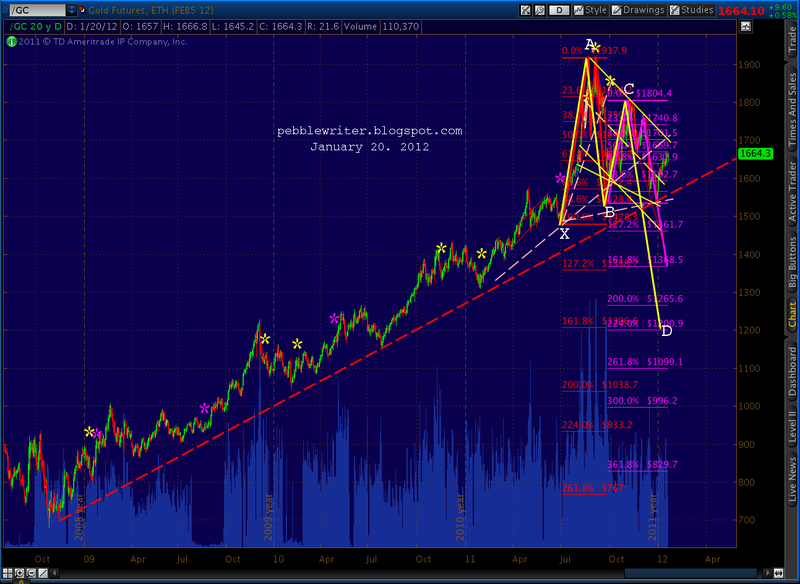 Quick update on Gold… Note the long term trend line (red, dashed) underlying the rise from the past five years or so. In July, we split off from the trend and started a formation that’s resulted in several fan lines (white, dashed) being formed, tested, and broken. 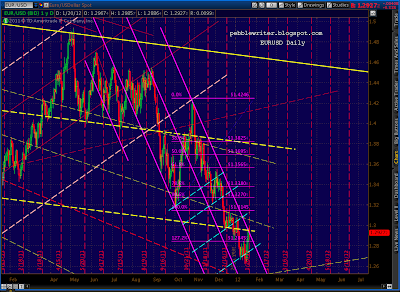 The latest intersects with the Dec 29 low, at which point we saw a $145 bounce. I expect the bounce to fail as prices back test the 2nd fan line somewhere south of its intersection with the channel that’s been guiding prices downward since August. 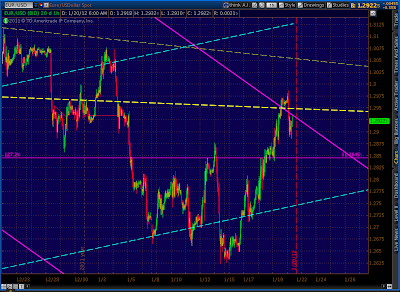 Currently, that would be around 1700. If we do get a reversal there, the latest Crab pattern (purple) should continue to play out to 1368 and eventually complete the even larger Crab pattern (yellow) to 1200. 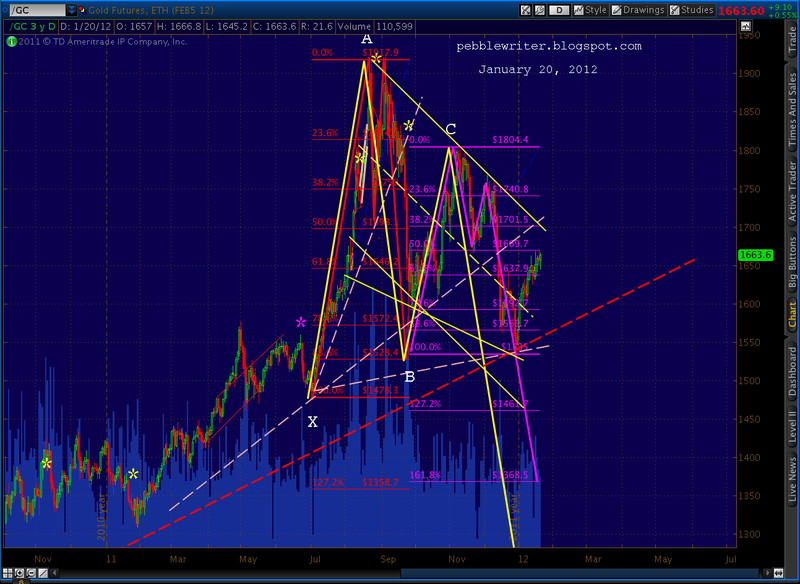 For the first, that would mean a C leg down slightly longer than the A wave down from 1926. 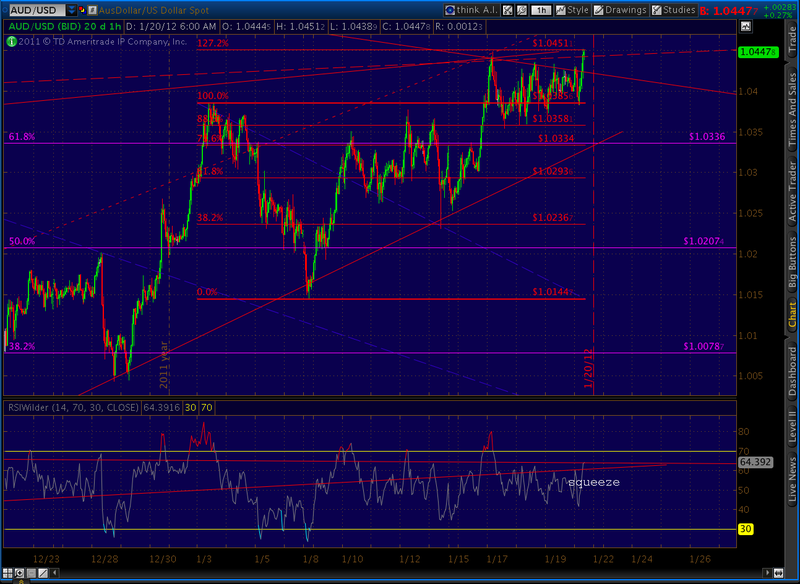 For the latter, of course, it’s a 1.618 extension. My gut is that gold will accompany stocks down on this next little excursion to bear country, complete an A-B-C correction, then resume its bull market when the Fed takes action to “fix” things. The first line in the sand, of course, is the channel line at 1700. If we can break out of the channel — only 37 away — then the next test is the previous high of 1804. 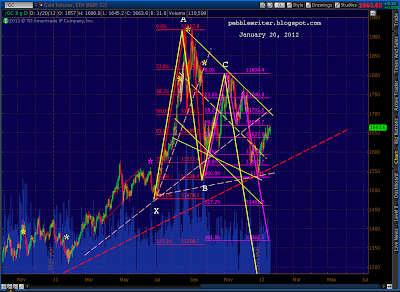 If we break either the fan line or, more importantly the red trend line, the correction is on. 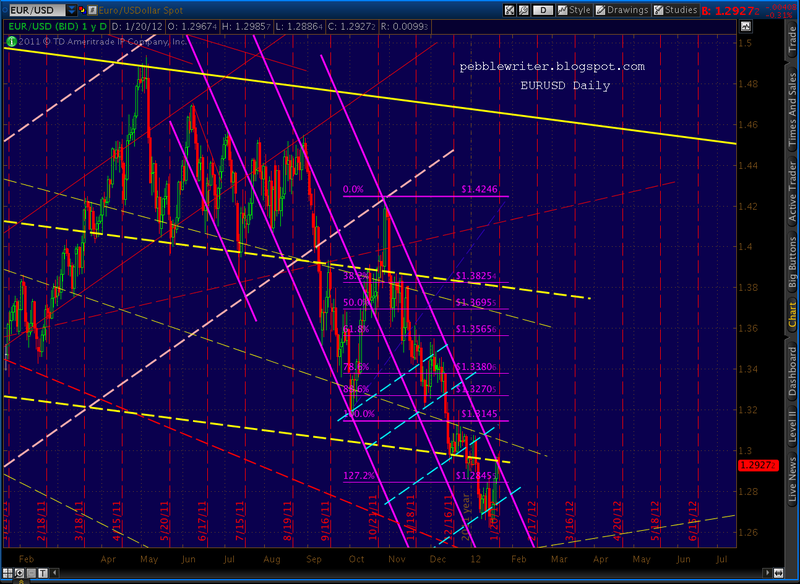 AUDUSD has finally pushed above the channel line — even if just a little. Recall we’re looking for a final push as high as 1.0519 – 1.0534 to complete both a large scale Gartley (shown in purple) and smaller scale Crab (red). [see: Jan 18 post] Given the squeeze going on in its RSI, I would view the completion of these two patterns a blow off top of sorts, and if history is any guide, synchronous with a top in equities. 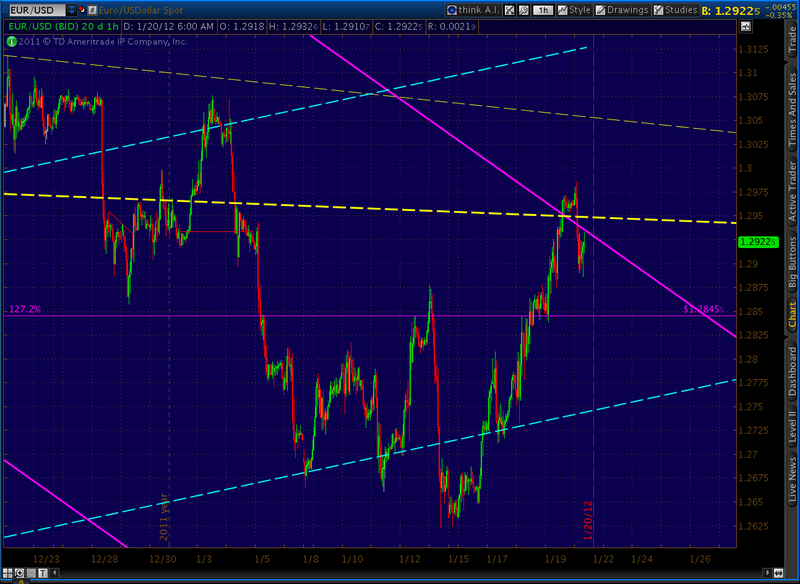 We’ve seen the reaction we were expecting on EURUSD, a reversal off the two channel lines. If the rumors about Greece are true, we’ll likely see a spike higher. But, really; how many times have we been led down this path? Though, it would fit nicely with the idea of a push slightly higher in stocks — the Butterfly completion at 1329 — as would the AUDUSD pattern completion mentioned above. Always a possibility. My gut is that bears are being played here. 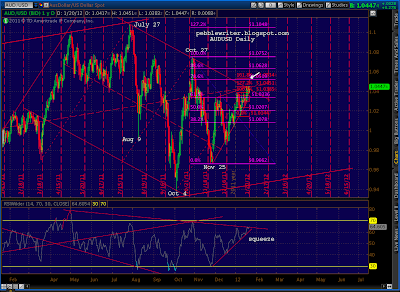 There's just enough bullish evidence to wash many of us out, just like in July. Grinding wave 2s like this are killers. Thanks for the vote of confidence Pebble, you always seem to be on "my side", lol. Actually, I don't think I named a time frame other than to suggest it's gotta be pretty damned soon. At least I didn't mean to give the impression it has to happen tomorrow or this week. I fully agree that the 1329 area is attainable. What I'm most concerned with is how it gets there. I pretty much detailed my concerns about that in the "But What IF" piece that I wrote on Friday. 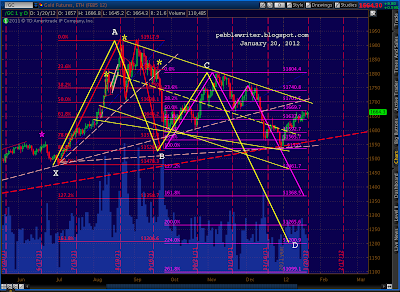 The chart below is from that article, and it shows the pattern I'm more concerned with. I'm worried about the blue part. 1329 had better not be attained "that way" or else I'm afraid we're probably looking at a whole different ball game than we've been expecting, because this would firmly finish off a clean 5 wave impulse off the October lows. Yeccchhh! I dunno man, I'm just thinking out loud here. When you couple the perfect areas of resistance/support on the SPX/AUD/VIX with the extreme bullish sentiment in the context of the NDX chart you posted a few days ago and its similarity to the July selloff it would not be surprising at all to see another waterfall selloff that brings us back into line with the 2008 analog on a timeframe basis – though this would basically have to occur in the next 2-3 weeks (not holding out for it, just pointing it out). Let's see how far the CBs intervention has really delayed things here. Nice call. Couldn't agree more. I think you're right, AR. 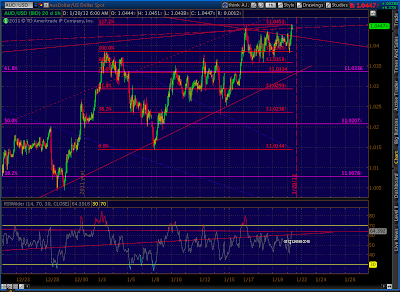 Not sure about the time frame, but I'll not be surprised if we get one last little bump maybe to 1329. And, BTW, I have no issue with the TA picture. Good work, as always. I've got something new for you to consider, something that should float your boat pretty darned good. You might have read one of my pieces recently where I asked the question "But What If?" All the best bud… I think our turn has arrived. 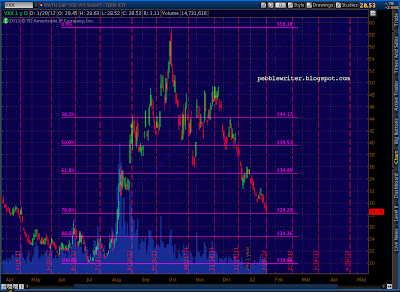 VIX definitely looks near a bottom here as it's hit a trendline extending May and July lows. This would imply that the end of Minor 2 is in or will be in by Mon/Tues. 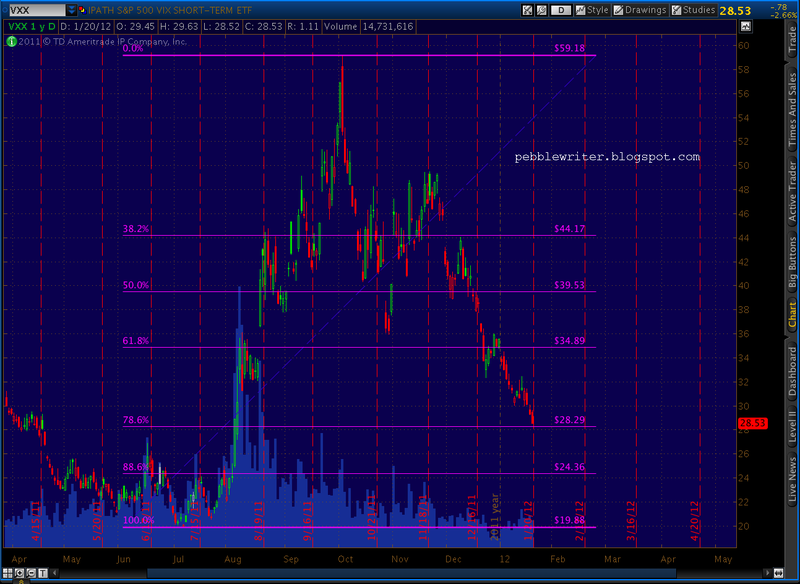 Friday's move on VIX looks like capitulation. wedges rarely make it all the way to the apex, usually 2/3 or so. Gartley's are thought to reverse .618 of the AD distance, so the implications are a pretty good pop back from the .786. but, VIX is probably more important — VXX is the ETF derived from VIX. 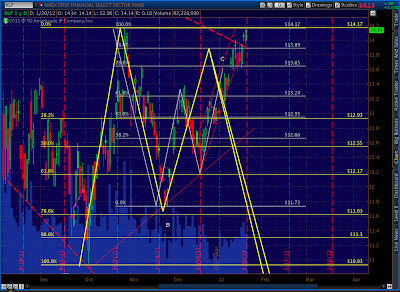 What is the implication for vxx finishing the gartley pattern? 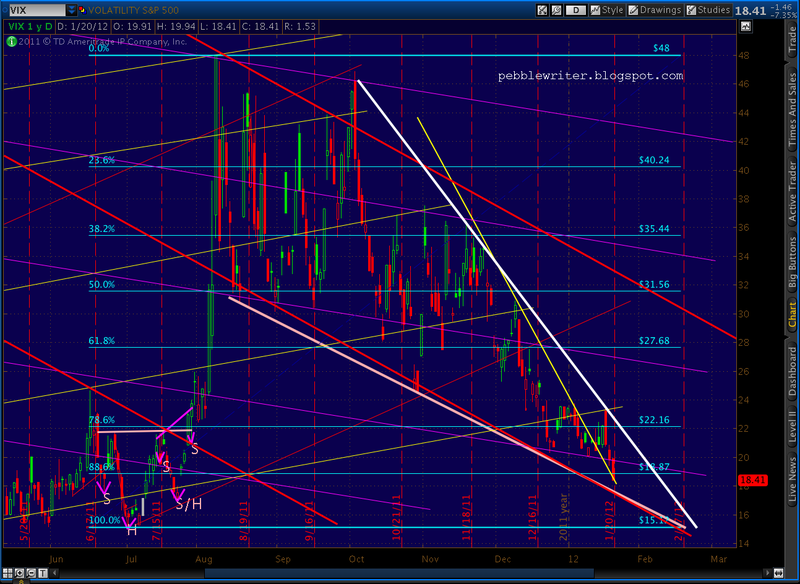 From the VIX chart, do you think it will go all the way to the apex of the larger wedge which is about 15ish? 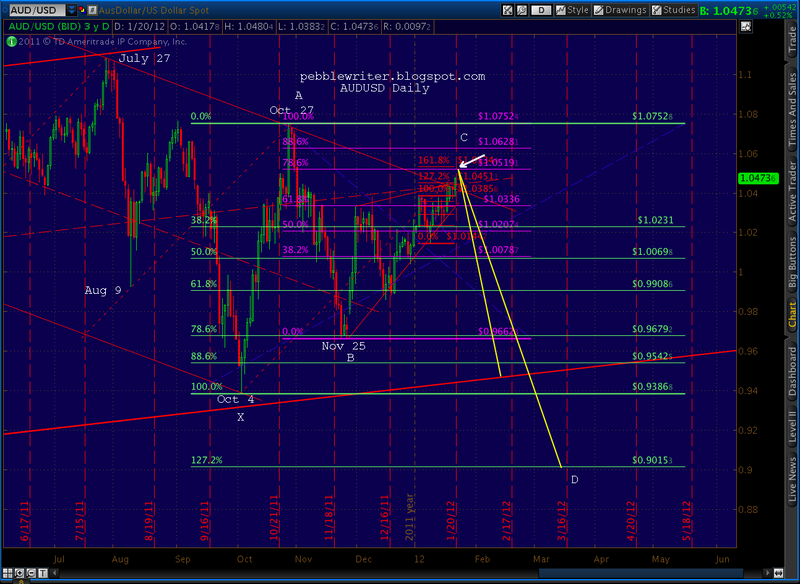 beetlejuice: Re the AUDUSD, if the Gartley completes at the .786 of 1.0519 then a .618 retrace of the AD distance would result in a price of .9989. But, I think there's more downside than just that. This next turn would form Point C in a giant Butterfly. Rather than describe it, I'll post it above. 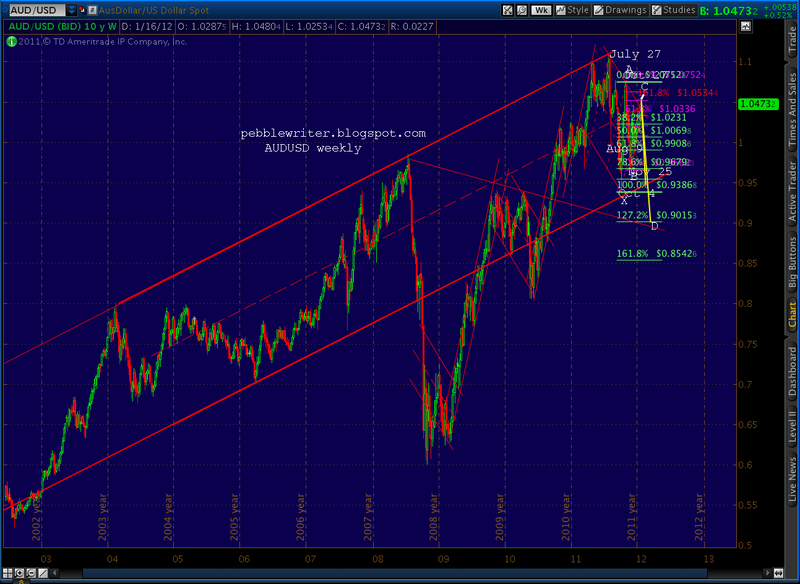 It would call for a drop to the 1.272 extension at .9015, but that would mean breaking through the channel AUDUSD has been in since Aug 2010 (1999 really, if you ignore the huge break in 2008-10.) So, I suspect we'd see a battle at the channel line currently around .9444 and rising to the .886 of .9542 around mid-April. PW, just don't make the subscription too expensive, I lost way too much money shorting:) This market is frustrating. 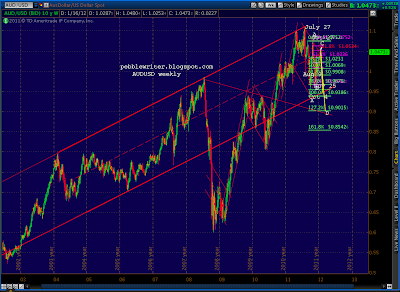 Hi Pebble what is your target for the AUD?